Mr. Kin Chan was appointed as a Non-Executive Director on 17 March 2010. He has been serving as a member of the Audit Committee with effect from 19 October 2011. Mr. Chan has been the chief investment officer of Argyle Street Management Limited since 2002 and is a deemed substantial shareholder of OUE Limited. Details of his deemed shareholdings can be found on pages 222 and 223 in Annual Report 2017. He was last re-elected as a Director at the Annual General Meeting held on 21 April 2016. Mr. Chan has been the chairman of TIH Limited, a company listed in Singapore since 2005 and has been appointed as a non-executive director of Mount Gibson Iron Limited, a company listed in Australia since September 2016. He has been appointed as a non-executive director of CITIC Resources Holdings Limited, a company listed in Hong Kong since March 2017. He was a non-executive director of (i) United Fiber System Limited (now known as Golden Energy and Resources Limited), a company listed in Singapore from 2011 to 2015; and (ii) Asia Resource Minerals Plc, a company formerly listed in London for the period from July 2015 to August 2015. 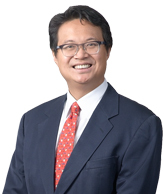 Mr. Chan earned an AB degree from Princeton University and a Master’s degree in Business Administration from the Wharton School of University of Pennsylvania where he was a Palmer Scholar.